A hydrocarbon gas such as methane and LPG is desulfurized in the presence of oxygen and an oxidation catalyst to convert sulfur compounds in the gas to sulfur oxides. The sulfur oxides are then trapped downstream of the oxidation by an adsorbent. The amount of oxygen added to the hydrocarbon gas to promote oxidation is such that the sulfur compounds are selectively oxidized and the oxidation of the hydrocarbon gas is minimized to reduce hydrogen formation. It is well known and desirable to reduce the level of gaseous sulfur compounds such as hydrogen sulfide (H 2S), carbonylsulfide (COS), mercaptans (R—SH), and sulfides (R1—S—R2) from hydrocarbon streams prior to reforming the hydrocarbon stream into useful gaseous components such as by either of reactions (I) and (2) above. Many applications, e.g., fuel cells, require that the gaseous sulfur compounds in a gas stream (e.g., naphtha, liquid petroleum gas (LPG), town gas, etc.) be reduced to as low a level as practicable in order to avoid polluting the environment or poisoning (i.e., deactivating) catalysts such as steam reforming catalysts, water-gas shift catalysts, etc. Fuels, such as natural gas, gasoline, diesel fuel, naphtha, fuel oil, LPG and like hydrocarbon fuels may not be useful as a process fuel source due to the existence of relatively high levels of naturally-occurring complex organic sulfur compounds, or sulfur compounds added as odorants, such as mercaptans and sulfides. Desulfurization of hydrocarbon streams is particularly beneficial for hydrogen generation and use thereof in fuel cells. Conventional fuel processing systems used with stationary fuel cell power plants include a thermal steam reformer, such as that described in U.S. Pat. No. 5,516,344. In such a fuel processing system, sulfur is removed by conventional hydrodesulfurization techniques, which typically rely on a certain level of recycle as a source of hydrogen for the process. The recycle hydrogen combines with the organic sulfur compounds to form hydrogen sulfide within a catalytic bed. The hydrogen sulfide is then removed using a zinc oxide bed to form zinc sulfide. A general hydrodesulfurization process is disclosed in detail in U.S. Pat. No. 5,292,428. There are many such prior art processes involving hydrogenation desulfurization in which the sulfur compounds in the fuel stream are decomposed by hydrogenolysis at temperatures of, e.g., 350 to 400° C. in the presence of e.g., Ni—Mo or Co—Mo catalysts and thereafter the resultant H 2S is then absorbed on a bed of ZnO at temperatures of, e.g., 300 to 400° C. However, in these processes, the level of the H2S remaining in the treated stream is often too high, e.g., 1 ppmV and higher. It is well known low levels of gaseous sulfur compounds will deactivate steam reforming nickel-based catalysts. Additionally, to remove the sulfur compounds from the gas being treated, hydrogen must be provided to the gas stream. In the case where the source of hydrogen is product gas in the form of recycle, this will reduce the overall efficiency of the power forming process. The present invention provides a process for the removal of sulfur compounds from a hydrocarbon feedstock. The process generally involves passing a hydrocarbon feed with a sub-stoichiometric amount of an oxygen-containing gas over an oxidation catalyst such that at least a portion of the sulfur compounds in the hydrocarbon feed are converted to SOx without substantial oxidation of the hydrocarbons. An adsorbent placed downstream of the oxidation catalyst captures and removes the SO x compounds from the hydrocarbon feed. Once desulfurized, the hydrocarbon feed may be reformed to desired products such as hydrogen. In accordance with one embodiment of the process, oxygen (O 2) is introduced into a hydrocarbon feedstock that is to be desulfurized, and the mixture is contacted with an oxidation catalyst. Air may be used as the oxygen source. An O2/C ratio is established so as to favor the oxidation of the sulfur compounds to SOx when the oxidation catalyst is contacted. For example, in the case of the hydrocarbon methane, as the O2/C ratio approaches stoichiometric levels with respect to methane partial oxidation reaction (1), H2S formation begins to supplant SOx formation due to reaction of the sulfur compounds with hydrogen. Therefore, the oxygen concentration relative to the hydrocarbon feed is controlled to limit reaction (1) and favor the selective oxidation of the sulfur compounds to SOx. The oxygen-containing gas, preferably air, is added and mixed with the hydrocarbon feed in an amount sufficient to establish a suitable oxygen-to-carbon ratio to provide the selective oxidation of sulfur compounds and minimize the partial oxidation of hydrocarbons to hydrogen. In this process, the sulfur compounds are preferentially converted to SO x, which can be readily captured downstream by an adsorbent. The addition of excess air leads to oxidation of the hydrocarbons and formation of hydrogen, which in turn leads to formation of hydrogen sulfide, which can be captured by zinc oxide or other suitable adsorbent. Thus, depending on the oxygen to carbon ratio, both SOx and H2S species may be present in the gas exiting the catalyst and then trapped downstream using a combination of SOx and H2S adsorbents. The oxygen content of the hydrocarbon stream is characterized as sub-stoichiometric. What this means is that the ratio of the molecular oxygen (O 2) content relative to the carbon (C) atoms present in the hydrocarbon feedstock is less than that required for completion of reaction (1), i.e., less than 0.5. Preferably, the oxygen-to-carbon ratio is less than 0.3, more preferably from 0.01 to 0.08. There is a gradual increase in the formation of H2S at O2/C ratios above 0.04. Therefore, most preferably, the O2/C ratio should not exceed 0.04. If the O2/C ratio in the hydrocarbon feed is within the substoichiometric range contemplated herein without the addition of air or some other oxygen source, no additional oxygen need be introduced, though oxygen may still be added to establish a higher O2/C ratio within the contemplated range. Catalyst compositions suitable for use in the process are not particularly limited, so long as the composition can catalyze oxidation of sulfur compounds contained in the hydrocarbon feed to SO x under the prevailing reaction conditions. Preferred oxidation catalysts include, as the catalytically active component, a metal selected from Group VIII of the Periodic Table of the Elements, and or base metal oxides such as oxides of chromium, manganese, iron, cobalt, nickel, copper and zinc. More preferred catalysts for use in the process comprise a metal selected from palladium, platinum and rhodium, and/or base metal oxides such as oxides of iron, cobalt, and copper. Other known oxidation catalysts may also be used, such as vanadium oxides and cerium oxides. Subsequent to oxidation of sulfur compounds in the hydrocarbon gas stream to SO x products, these sulfur oxides are removed from the hydrocarbon stream. This is accomplished by placing an adsorbent trap downstream from the oxidation process whereby the SOx products contact with the adsorbent to trap and remove the sulfur oxides from the hydrocarbon stream. While the adsorbent material is not particularly limited so long as it is capable of adsorbing SOx at the prevailing conditions, the sulfur oxide traps preferably comprise alkali metal oxides, alkali earth metal oxides and/or base metal (Fe, Ni, Cu, Zn) oxides, which oxides are preferably supported on porous materials such as silica, alumina, etc. Under conditions where H2S is formed, the trap may further comprise and any effective H2S adsorbing material, such as zinc oxide. The form of the SOx and H2S adsorbent materials is not particularly limited. Preferred forms include pellets and washcoated monolithic structures. The principle of operation of a fuel cell is simple. Hydrogen gas is electrocatalytically oxidized to hydrogen ions at the anode composed of Pt deposited on a conductive carbon. The protons pass through a membrane of a fluoropolymer of sulfonic acid called a proton exchange membrane. At the Pt on carbon cathode, O 2 from air is electrocatalytically reduced and combines with the protons producing H2O. The electrons flow through the external circuit. The cells are stacked in series to generate higher voltages. The mixture of carbon monoxide and hydrogen prepared by reformation of the treated hydrocarbon is particularly suitable for use in the synthesis of hydrocarbons, for example by means of the Fischer-Tropsch synthesis, or the synthesis of oxygenates, for example methanol. Processes for the conversion of the mixture of carbon monoxide and hydrogen into such products are well known in the art. Gas Chromatography (GC) is used to analyze the inlet and outlet to a partial oxidation catalyst. The inlet gas contains methane and 16 ppmV each of COS, ethylmercaptan, dimethylsulfide, and tetrahydrothiophene. The catalyst is platinum supported on 20% ZrO 2 impregnated SiO2 (Pt/20% ZrO2—SiO2) catalyst (80 g/ft3 Pt). Air is added to the gas such that the O2 to carbon ratio in the feed is 0.02. The mixture of feed gas and air is passed over the catalyst at 275° C. inlet temperature and 20,000/hr space velocity. The pressure is ambient (1 atmosphere). GC analysis (FIG. 1) of the outlet to the catalyst shows that the organic sulfur compounds in the feed are all converted to an inorganic sulfur compound. GC-MS analysis further confirms that SO2 the only sulfur compound formed. In this example, the same methane feed containing the same concentration of sulfur compounds as in Example 1 is provided with air at the same O 2/C ratio and treated with the same catalyst and conditions as in Example 1. A 30% Cs/alumina trap is placed downstream of the catalyst. The trap is supported on a monolith with a loading of 1 g/in3, and operated at 3000/hr space velocity. The outlet temperature of the trap is measured at 370° C. No sulfur was observed at the outlet of the Cs trap (<10 ppb S) until breakthrough is observed after 26 hours. The Cs/alumina trap has a trapping capacity for SO2 of 2.7 g S per g Cs/alumina trap. In this example, desulfurization of methane is achieved with the same oxidation catalyst as used in Example 1. 5.25 ppmV each of COS, ethylmercaptan, dimethylsulfide and tetrahydrothiophene were included in the methane feed stream. Inlet temperature, space velocity and the O 2/C ratio were the same as in Example 1. A downstream trap of 20% K/alumina having a trap capacity of 5.9 g S/100 g trap was used to capture the oxidized sulfur species. The test was run for the first 35 hours at a space velocity for the catalyst of 20,000/hr. For the last hour the time on stream, the catalyst was operated at 10,000/hr. Sulfur is not detected at the exit of the trap until the trap capacity is expended after 36 hours on stream. This example illustrates the conversion and interconversion of sulfur compounds at high concentrations of organic sulfur in a methane-propane mixture (Table 1). Natural gas is composed of methane and lower concentrations of heavier hydrocarbons such as ethane, propane, butane, etc. In this example, methane is combined with propane, carbon dioxide, and air to give a composition 81% methane, 3% propane, 4% CO 2, 8.6% air. The resulting O2/C ratio is 0.02. Sulfur compounds are added to the mixture at 16.7 ppmV each carbonylsulfide, ethylmercaptan, dimethylsulfide, and tetrahydrothiophene. The catalyst is similar to the one used in Example 1, except that the Pt loading is 68 g/ft3, operated at 20,000/hr. The trap is comprised of ⅛″ pellets of 20% K/alumina, operated at a space velocity of 1510/hr. Note that the total sulfur concentration is 150 ppmw with respect to organic carbon. This is 5 to 6 times higher than the maximum concentration of sulfur in natural gas. COS and ethylmercaptan were not detected at the outlet at any time ([S]<0.005 ppmV). We postulate that the thiophene is a dehydrogenation product of tetrahydrothiophene. No sulfur compounds are detected downstream of the trap at 325° C. at any time on stream to 127 hours. This example illustrates the conversion of sulfur compounds in methane using a non-precious metal catalyst (V 2O5). The catalyst is from BASF (O 4-115), a Cs promoted V2O5 catalyst, crushed pellets operated at a space velocity=1500/hr. The trap downstream of the catalyst is monolith supported 20% K/alumina 1 g/in3, operated at 1880/hr. The gas composition is: 89% methane, 8.6% air, N2 (not including N2 from air); O2/organic C=0.020. Sulfur species and concentrations are 12.5 ppmV each COS, ethylmercaptan (EM), dimethylsulfide (DMS), tetrahydrothiophene (tHt). The total sulfur concentration is 112 ppmw with respect to the organic carbon. This is 3 to 4 times higher than the maximum expected sulfur concentration in natural gas. COS and ethylmercaptan were not detected at the outlet at any time ([S]<0.005 ppmV). The GC analysis is performed after 15 minutes at each temperature. We postulate that the thiophene is a dehydrogenation product of tetrahydrothiophene. The apparent conversion at 250° C. and then increase in breakthrough S concentration up to 325° C. is due to adsorption on the catalyst at 250° C. followed by desorption as the temperature is increased. The data are average values of analyses obtained every 15 minutes for 24 hours. The catalyst is the same as that in Example 1 (Pt/20% ZrO 2—SiO2, 80 g/ft3 Pt). Trap: 20% K/alumina supported on a monolith at 1 g/in3, 1880/hr; sulfur species and concentrations: 12.5 ppmV each COS, ethylmercaptan (EM), dimethylsulfide (DMS), tetrahydrothiophene (tHt); Gas composition: 87% methane, 0.1% to 0.2% hexane, 8.6% air, 1.5% CO2, N2 (not including N2 from air); O2/organic C=0.020. Comments: total sulfur is 112 ppmw with respect to the organic carbon. COS and ethylmercaptan were not detected time on stream ([S]<0.005 ppmV). Catalyst inlet temperature=275° C.
Example 7 illustrating the desulfurization of LPG was repeated except the inlet sulfur concentration was increased from 70 ppmW to 120 ppmW (weight part per million with respect to propane+propylene; this is equal to 100 ppmV for the air-hydrocarbon mixture). An O 2/C ratio of 0.04, an inlet temperature of 300° C. and a space velocity varying between 10,000 to 20,000/hr. were used. Results of sulfur breakthrough are shown in Table 5. As shown in Example 8, LPG desulfurization presents a different challenge than methane because of the higher concentration of sulfur in LPG and the increased reactivity of LPG to air. Accordingly, the process of Example 8 was run with a different catalyst. Thus, a catalyst formulation of Pt/ZrO 2—SiO2+Pt/CeO2 was used under the conditions of Example 8. Example 8 was run except the oxidation catalyst was 1:1 Pt:Pd/WO 3—TiO2 (85 g/ft3 total precious metal). The fresh catalyst produces copious quantities of H2S at 300° C. and above. Note that with a trap formulation the includes an H2S trap such as ZnO, the H2S can be removed from the process gas exit stream. When the temperature is decreased to 275° C., the catalyst performance improves dramatically. However, with time on stream, the catalyst loses activity at 275° C. It's performance is recovered by operating at the higher temperature. The values in the table represent average catalyst out concentrations. Methylmercaptan is formed over the catalyst and is identified from its retention time. 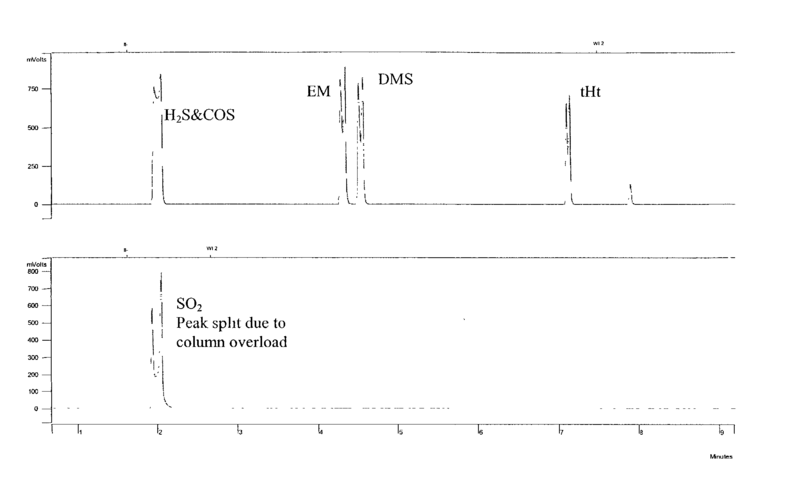 Example 8 was run except the oxidation catalyst was Pt/TiO 2 (71 g/ft3) When this catalyst is operated at 335° C. without first reducing it in H2, the total sulfur out is initially approximately 3 ppmV, mostly as thiophene. Over 36 hours of time on stream, the thiophene out decreases gradually to 0.6 ppmV. When the catalyst is first reduced in H2 before use (10% H2 at 300° C. for two hours), the thiophene out decreases rapidly (within 3 hours time on stream) from 2 ppmV to below detectibility. It gradually increases to 0.3 ppmV; the catalyst activity can be increased by raising the inlet temperature to 350° C., where no sulfur is detected at the trap outlet. (c) contacting the SOx with an adsorbent capable of adsorbing SOx, wherein at least a portion of the SOx is adsorbed on the adsorbent. 2. The method of claim 1 wherein the oxidation catalyst is sulfur tolerant and is supported by a sulfur tolerant support material. 3. The method of claim 1 wherein the oxidation catalyst comprises a precious metal, a vanadium oxide, a cerium oxide, or a base metal oxide. 4. The method of claim 1 wherein the oxidation catalyst comprises a platinum-containing material. 5. The method of claim 1 wherein the step of increasing the O2 content of the hydrocarbon gas is performed to establish an O2/C mole ratio within the range of about 0.01 to 0.08. 6. The method of claim 1 wherein the step of increasing the O2 content of the hydrocarbon gas is performed to establish an O2/C mole ratio within the range of about 0.01 to 0.04. 7. The method of claim 1 wherein the hydrocarbon gas comprises methane. 8. The method of claim 1 wherein the hydrocarbon gas comprises liquefied petroleum gas. 9. The method of claim 1 wherein the hydrocarbon gas is within the temperature range of about 200-600° C. when contacting the oxidation catalyst. 10. The method of claim 1 wherein the hydrocarbon gas is produced by vaporizing a liquid hydrocarbon. 11. The method of claim 1, wherein the adsorbent capable of adsorbing SOx is a metal oxide selected from the group consisting of an alkali metal oxide, an alkali earth metal oxide and a base metal oxide. 12. The method of claim 1, further comprising the steps of converting at least a portion of the sulfur compound to H2S, then contacting the H2S with an adsorbent capable of adsorbing H2S. 13. The method of claim 12 wherein the adsorbent capable of adsorbing H2S is zinc oxide. 14. The method of claim 1, further comprising the step of reforming the hydrocarbon gas to produce H2 after step (c). 15. The method of claim 14, further comprising the step of utilizing the H2 in a fuel cell to produce electricity. b) contacting the SOx with an adsorbent capable of adsorbing SOx, wherein at least a portion of the SOx is adsorbed on the adsorbent. 17. The method of claim 16 wherein the oxidation catalyst is sulfur tolerant and is supported by a sulfur tolerant material. 18. The method of claim 16 wherein the oxidation catalyst comprises a precious metal, a vanadium oxide, a cerium oxide or a base metal oxide. 19. The method of claim 16 wherein the oxidation catalyst comprises a platinum-containing material. 20. The method of claim 16 wherein the hydrocarbon gas comprises methane. 21. The method of claim 16 wherein the hydrocarbon gas comprises liquefied petroleum gas. 22. The method of claim 16 wherein the O2/C mole ratio of the hydrocarbon gas is within the range of about 0.01 to less than 0.3. 23. The method of claim 16 wherein the O2/C mole ratio of the hydrocarbon gas is within the range of about 0.01 to 0.08. 24. The method of claim 16 wherein the hydrocarbon gas is within the temperature range of about 200-600° C. when contacting the oxidation catalyst. 25. The method of claim 16 wherein the hydrocarbon gas is produced by vaporizing a liquid hydrocarbon. 26. The method of claim 16 wherein the adsorbent capable of adsorbing SOx is a metal oxide selected from the group consisting of an alkali metal oxide, an alkali earth metal oxide and a base metal oxide. 27. The method of claim 16, further comprising the steps of converting at least a portion of the sulfur compound to H2S, then contacting the H2S with an adsorbent capable of adsorbing H2S. 28. The method of claim 27 wherein the adsorbent capable of adsorbing H2S is zinc oxide. 29. The method of claim 16, further comprising the step of reforming the hydrocarbon gas to produce H2 after step (b). 30. The method of claim 35, further comprising the step of utilizing the H2 in a fuel cell.